Am I late with this post or what. Technically speaking, leopard prints were meant to dot my blog from top to toe and everywhere in between, last month, but instead, here we are, right smack in the first week of August and I’m still speaking about those spots. I could very easily blame my tardiness on my newly acquired frequent traveller role. Indeed, I could. And I’m rather leaning towards that. I have, after all, been living out of suitcases for the past 4 weeks, with another fortnight to go. But I’ll play nice. And I’ll apologise from the very bottom of my heart because my timing is way off 🙂 by a month and three continents. It has been quite the adventurous time, I’m telling you. First I was in NYC then in Chicago then off to Melbourne then to Kuala Lumpur, and, now, Kuching. Enough of my pseudo jet-setting adventures (I have to save those for another post) and more on the Fab 40s. You know who we are; Ann, Dawn Lucy, Dixie, Jane and myself. We are the fearless five. The feisty five. The fabulous five who are having loads of fun with fashion in our forties. And we hope that you’ve been enjoying the ride too. Since exploring the themes of Marsala & Denim, Jumpsuits, Gingham, Lace and Leopard Print, we’ve come full circle. We put our heads together, wondering how we could further improve upon the series, you know, and Ann was the first to come up with a delightful idea. Therefore, in the next bout of The Fab 40s, we have a little surprise for you 🙂 obviously I can’t/shan’t tell you now because it wouldn’t be a secret afterall, if I did, would it? I promise, it’ll only add to the merriment. Pinkie swear. For now though, please join me (if somewhat belatedly) in delighting in their lovely oh-so-individual interpretations of that glorious feline print, Leopard. 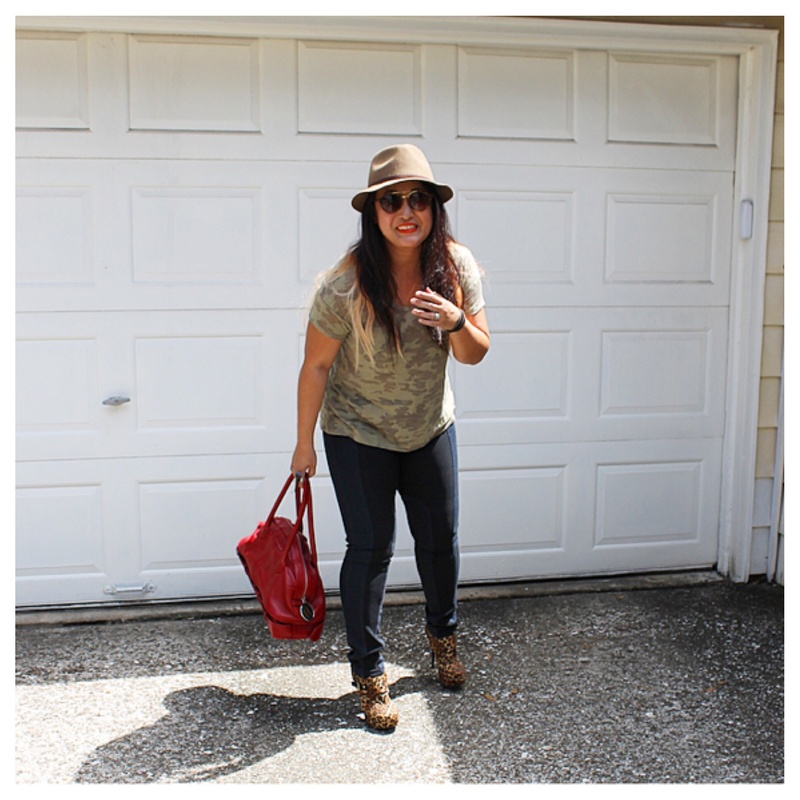 My entire outfit, with the exception of hat and booties, is from Poshmark. Wow, I didn’t really think about how much I shop on that app (and I hope neither is my man). 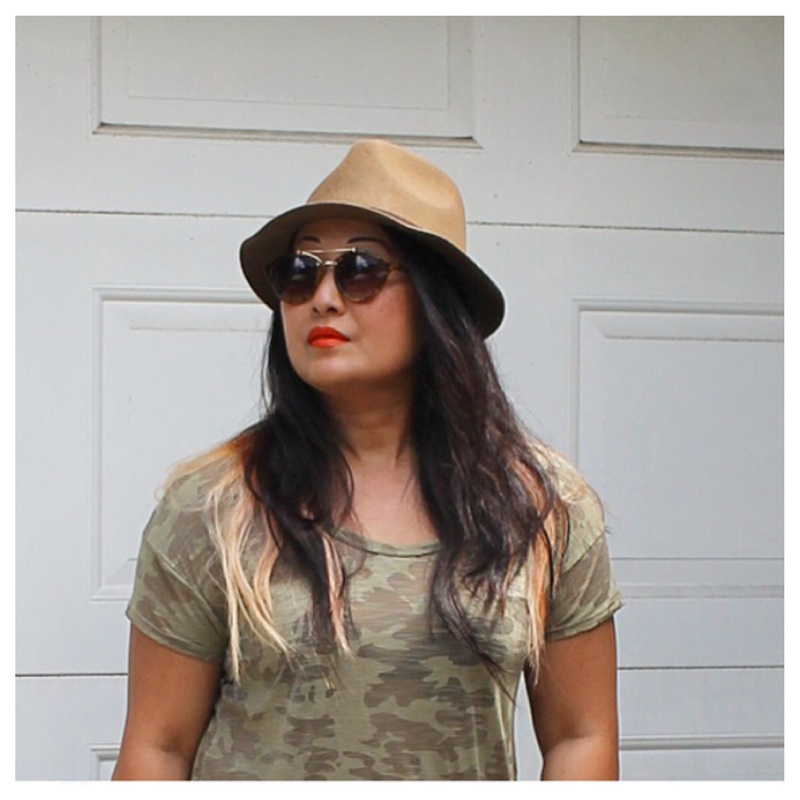 The Camo top is from Madewell, the Denim & Leather Jeggings BCBG. 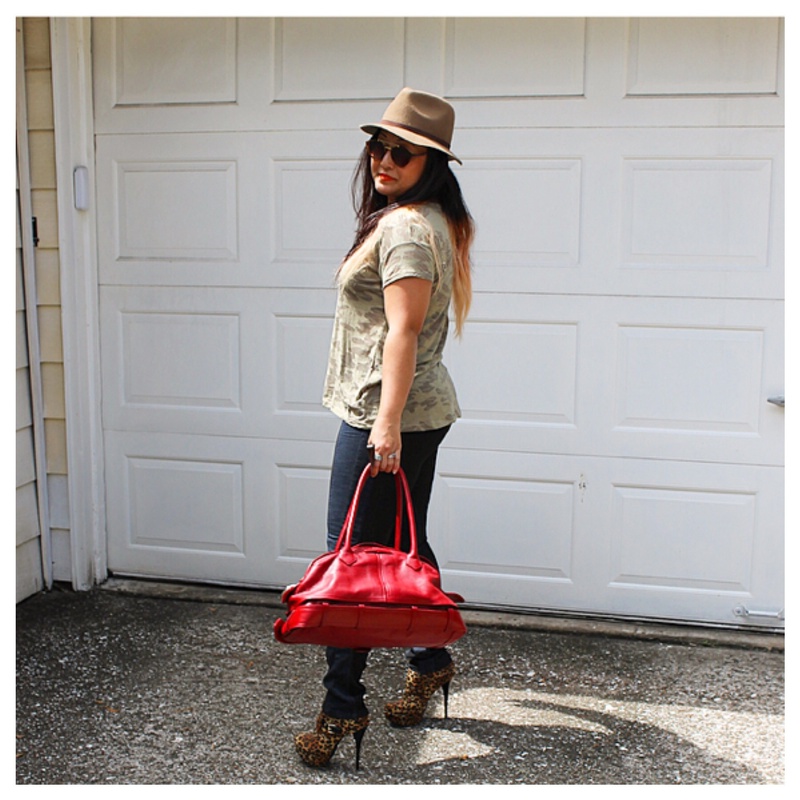 Hat is from Forever 21 and fabulous Leopard Ankle Booties, a gift from my daughter. Oh and the bag? Gaultier, dahlink. Such a fun series! I love Dawn and have only recently met Ann through the “bloggers who have Inspired Me” link up…which by the way I thank you for joining :). 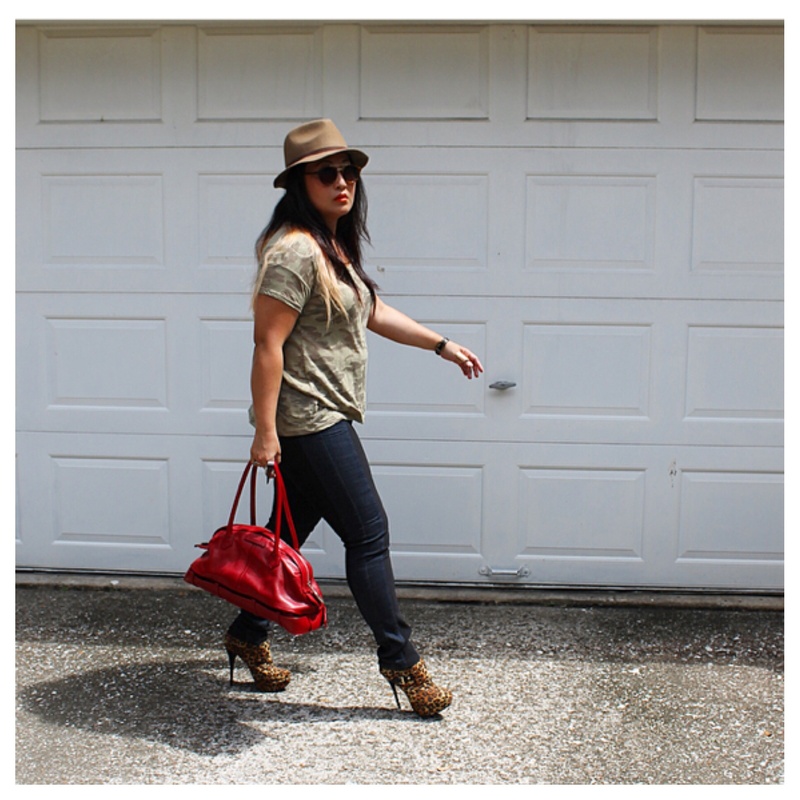 You look fierce but cool with this look, love those leopard heels. Thank you so much, Jaymie, for visiting my blog and commenting. I know how many you must have on your list and the fact that you took the time to come to mine is so very much appreciated. Me too me too!!! I have animal prints for clothes and shoes and jewellery and accessories and everything in between 🙂 sista!! 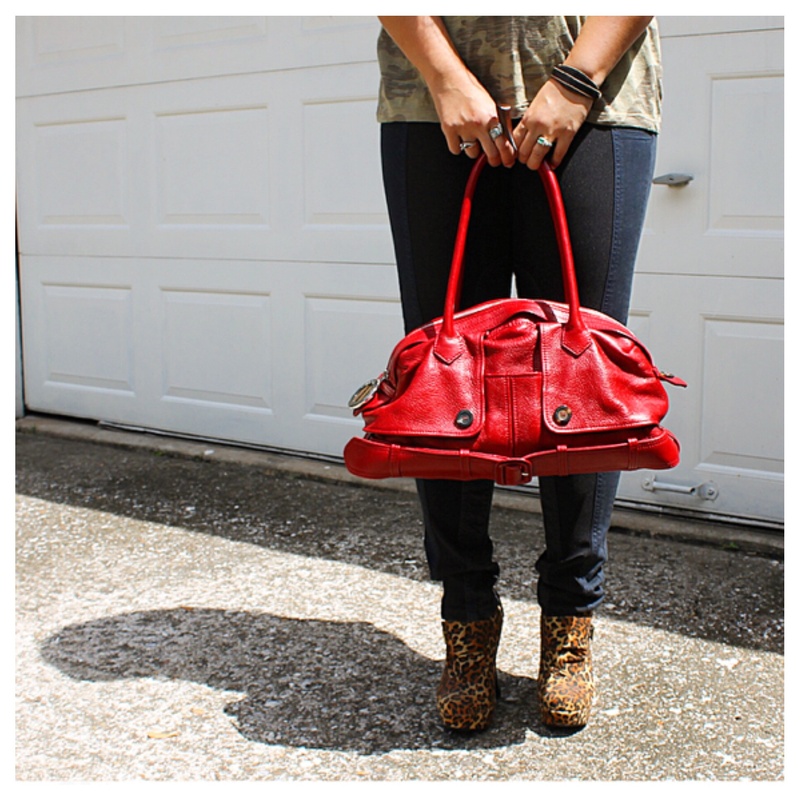 I love leopard and wearing pops of it with an outfit. Your shoes are such a statement piece!! I can’t believe how much you’ve been traveling lately. How do you keep it all straight? I apparently can’t keep it straight, Betsy LOL I was approximately a month late with this post GRIN thankfully, there are no more planes in my immediate future. Phew. You ladies are all rockin the leopard print! I love it! Thanks for linking up! Those booties are so fierce!!! Cool look. I love your hat. Ohh wee, y’all did leopard!?! How did I miss this, you ladies are KILLING IT! You’re forgiven because the boots are AWESOME!! I used to think leopard print (all animal prints?) were a bit tacky but for the past couple of years I’ve really been liking it. 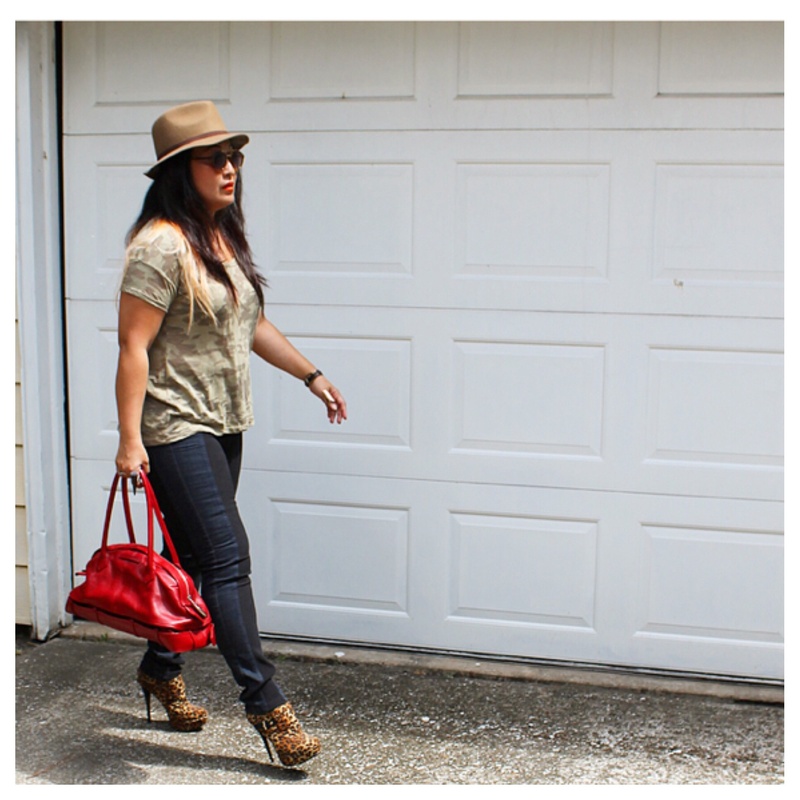 If you wear it in moderation & know how to style in outfits & otherwise, it can look so sophisticated. I love how you wore it in the boots. Does has to be my favourite place to have a bit of leopard print! Thank you so very much, Shannon 🙂 yes, animal prints “can” get a little much. Balance, balance, balance, yes? leopard prints are always so cool and on-trend, my dear, so i really don’t think you’re late on posting this casual-chic outfit…. You are freaking fierce and I love the fab forty series!